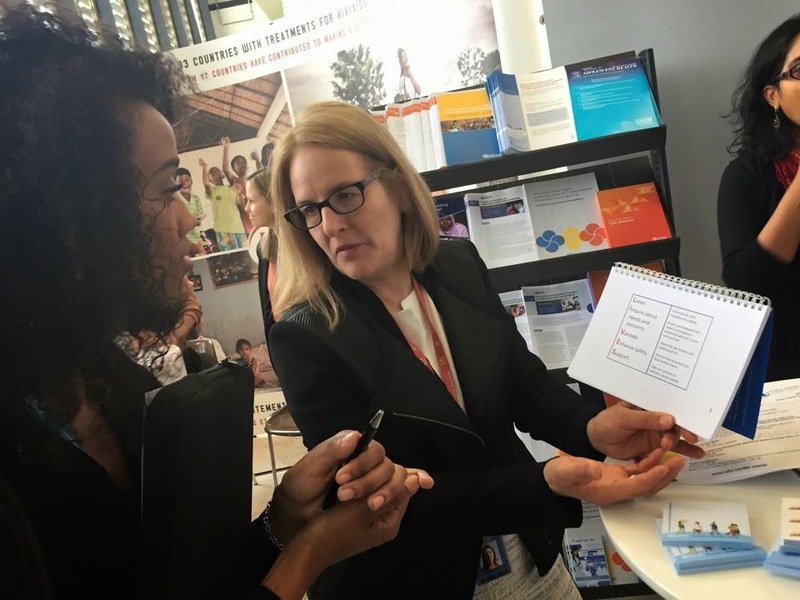 One aspect of our experiences at the 68th World Health Assembly so far has been to meet with brilliant global health leaders – and obtain career advice from them. And in that respect, we all own thanks to our professor Dr. Heather Wipfli, for her tremendous effort in not only having enabled these exchanges to happen which will clearly benefit the professional and personal life of ours beyond, but also in making sure everyone is immersed in that intense atmosphere and able to gather various pieces from people and discussion together that could guide our career path and choices as public health students. For instance, on our second day at the WHA, we were honored to meet Cary Adams, Chief Executive Officer at the International Union Against Cancer (UICC). During his brief moment with us, Mr Adams spoke with passion and wit, and shared such hope as to see more rising talents – not necessarily with a title-matching CV, but with the dedication, flexibility and universal skill set that are desired by the arena of health. And it is indeed crucial for the health sector to embrace people from business, finances, social sciences, etc, before its instrumental role in almost all mankind activities can be recognized by multiple sectors. It is even more, for the mindset of corporates in terms of seeing public health as one of the many on their (limited) CSR budget versus an essential gene for the survival – to be re-programmed. Adam’s talk resonated with the idea that Dr Stefan Oschmann, Vice Chairman of Merck, stressed during Monday morning’s Panel speech on the booming role and crying need for Public-Private Partnerships in health at the InterContinental. To paraphrase from Oschmann – often people tend to perceive the private sector as greedy, profit-driven, governmentals as sluggish and slow-acting, and NGOs as publicity chasing. In the world of global health, however, all we need to do is break these ideological barriers and work side by side as human. Another expert we had the chance to learn from yesterday was Dr Claudia Garcia-Moreno, leader at WHO on women and HIV/AIDS and on violence against women. She shared with us how she started as a physician, then developed a specialization in HIV/AIDS intervention in Africa leading to her particular interests in infected women and the cause, and ended up spending 25 years in Africa, Latin America and Asia working on women’s health and gender-based violence. As a champion for women’s rights and empowerment, and a role model for all of us, Dr Garcia-Moreno shared her opinion on how professional, strong and independent woman were often addressed: “people call me difficult which I couldn’t understand. But I wouldn’t have achieved what I did without that ‘difficult part’ of me. It now has become a compliment.” In addition, she encouraged us to secure fieldwork and exposures in middle/low income-countries before opting for a position at organizations such as WHO, and never to forget about or avert the real world happenstances/sufferings. Last, I feel lucky to be on the USC delegation too! We work closely as a team. Each of these bright, young public health professionals brings in a unique approach/perspective to the discussion. And through the exchanging process we learn from one another, too, which completes and accelerates my overall learning experience!